The former leader of the pro-Kurdish Democratic Union Party (PYD), Salih Muslim, has been arrested in the Czech capital after an extradition request from Turkey. Turkish authorities and Syrian Kurdish militias (YPG) confirmed the arrest of Muslim, said the foreign affairs spokesman for the political coalition, the Movement for a Democratic Society, that governs the Kurdish regions of northern Syria. As it continues its Olive Branch operation to crash Kurdish forces in Afrin, Turkey claims that the PYD and the YPG are part of the Turkish-based Kurdistan Workers’ Party, or PKK, which was designated as a terrorist organization by the European Union and the United States, although the Syrian organizations were not. The Turkish interior ministry had offered a bounty of nearly $1m on Muslim, who is listed as one of the “most wanted terrorists” in Turkey. 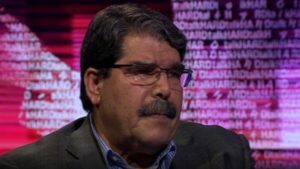 The PYD, for its part, denounced the arrest, saying that Saleh Muslim has “full citizenship rights” as a Syrian national and was visiting Europe in an official capacity. In a statement, the party accused Turkey of “demanding the arrest of individuals who are not its citizens … without any legal justifications”. Written by: Jaber Ali on February 25, 2018. Posted by Jaber Ali on Feb 25 2018. Filed under Headlines, World News. You can follow any responses to this entry through the RSS 2.0. Both comments and pings are currently closed.